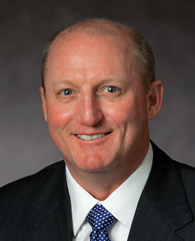 WACO, TEXAS – The American Football Coaches Foundation® today announced that Gregory E. Abel, Chairman, President and Chief Executive Officer of Berkshire Hathaway Energy, is the 2015 recipient of its CEO Coach of the Year® Award. This is the highest honor bestowed by the organization, whose inaugural recipient in 2006 was Jeffrey R. Immelt, the CEO of General Electric. Former Domino’s Pizza CEO David Brandon, former MidAmerican Energy Holdings CEO David Sokol, former HP CEO Mark Hurd, FedEx Corp. Chairman and CEO Frederick W. Smith, BP Capital L.P. Chairman and CEO T. Boone Pickens, NFL Commissioner Roger Goodell, ExxonMobil Chairman and CEO Rex W. Tillerson and AT&T Inc. CEO Randall Stephenson received the honor in 2007, 2008, 2009, 2010, 2011, 2012, 2013 and 2014, respectively. Mr. Abel was selected for the award by a unanimous vote of the AFCF® Board of Directors. He will be honored at The Foundation’s CEO Coach of the Year Dinner, held at The Waldorf=Astoria® in New York, N.Y., on December 14, 2015. Mr. Abel, 52, is chairman, president and CEO of Berkshire Hathaway Energy, based in Des Moines, Iowa. Through its energy-related businesses and direction under Mr. Abel, Berkshire Hathaway Energy provides electric and natural gas service to more than 11.5 million customers worldwide. These businesses are Pacific Power, Rocky Mountain Power and PacifiCorp Transmission, comprising PacifiCorp; MidAmerican Energy Company; NV Energy, Inc.; Northern Powergrid Holdings Company; BHE Pipeline Group; BHE U.S. Transmission; AltaLink, L.P.; BHE Renewables; and HomeServices of America, Inc., which is the second-largest residential real estate brokerage firm in the U.S.
Mr. Abel also serves as chairman, CEO and director of PacifiCorp; as chairman and director of NV Energy, Northern Powergrid and Northern Natural Gas, and as a director of AltaLink and HomeServices. Mr. Abel serves on the board and executive committee of the Edison Electric Institute and the Greater Des Moines Partnership. He also serves on the H.J. Heinz Company board of directors; the AEGIS Insurance Services, Inc. board of directors; the Nuclear Electric Insurance Limited board of directors; the Kum & Go, L.C. board of directors; the executive board of the Mid-Iowa Council Boy Scouts of America; the American Football Coaches Foundation board of directors; and is a past member of the Drake University board of trustees. Mr. Abel received his Bachelor’s Degree from the University of Alberta in 1984.